Mines, mines and now yours! This is the easy mine tour that should be doable by just about everyone. In about 7.6 miles round trip with 1,400 feet of accumulated elevation, you get to see 4 mines, the impressive Sunflower processing facility and associated water tanks and other mine equipment. This is all done in the beautiful background of the Mazatzal Mountains which will let you know you have left the desert for a day. All 4 of the mines you will see on this tour are legitimate horizontal tunnels that have not been covered up in any way. The Sunflower mine is the largest and the only one with an "L" shape having a corridor going off to the right at the visible back wall. You enter these mines at your own risk since there is always a fear walls can collapse. I personally went in 3 of them, the bowing of the front entrance to the bonus mine (my name for it) scared me away from that one. The hike begins at the Mormon Grove trailhead and proceeds on the Saddle Mountain trail for 1.35 miles to an unmarked intersection which was once a dirt road (shown on the USGS 24K map, Lion Mountain topoquad at N 33 56.926 W111 30.654). We go right (east) on the road which is rocky for 100 yards after which the road/trail becomes clear and easy to hike. Following the road you come upon the only downed tree that you must hike around going right around the root. Drop back down and in a very short distance in the wash you come to what I call the "bonus mine" that I chose not to enter because of the bowing of the front entrance. There are remains of a stone structure with large pipes nearby. Continue on the road about 500 feet to a road going off to the right and turn on it. A good dirt road continues straight there and I hiked it to its end points and can assure you there is nothing much there. After going right you are in for some great views of the Mazatzals and eventually the Sunflower processing facility will come into plain view. As you reach the bottom of the road you will see a large tank and the Sunflower mine is behind it. I did go in there and it was filled with flies that buzzed me but didn't find me tasty. It's your choice of what to do first here: hike right and go to the processing facility or left and go up the canyon a short distance to two more mines. The first mine is on the way with a nearby tank and the second after a short distance and a U turn going up the hill to the mine. After visiting all the features of this hike simply retrace your route and hike back to the trailhead. If you are up for a longer hike you can hike out FR25A along the West Fork which is a nice flowing creek that I like hiking by. You can turn back whenever you want. And if you are up for a really long loop you can continue along the creek about 1/2 miles past the wrecked Ford Step Van there to the intersection of the Cornucopia and West Fork (260) trails. The sign only shows the Cornucopia trail but you will notice a trail going off to your left and uphill. That is the West Fork trail going about a mile and 800 feet of elevation to the intersection with the Thicket Springs trail. The West Fork trail is overgrown in several places and will require some bushwhacking. The sign does show both the Thicket Springs and West Fork trails but the mileage figures are lies. Its 1.15 miles to the Sheep Creek trail not 1/2 miles. And the West Fork trail is 1+ miles. Turn left here and hike to Sheep Creek trail intersection where you will find mine 5 for the day 100 feet before the trail intersection. Turn left on Sheep Creek and hike to its intersection with the Saddle Mountain trial. 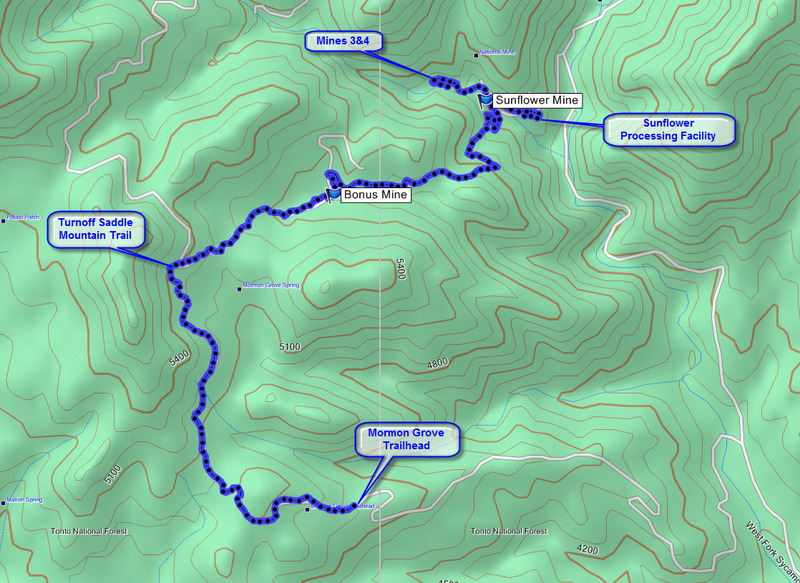 Then turn right on the Saddle Mountain trail and hike 3.4 miles to the trailhead. The Thicket Springs, Sheep Creek and Saddle Mountain trails are part of the Arizona Trail. This loop is about 13 mile and would be rated strenuous. Note: Compared to the Saddle Mountain Mine Tour this hike does not go to the Story Mine which has caved in long ago and is not visible anyway. It also does not go by the ruins of a Stone House. But it does eliminate the need for a difficult hike past the Stone House through a rugged canyon in which there is much bushwhacking. Some good hikers have turned around without completing this section. Others have completed it but would not do it again and I have joined this group. It was beautiful and rugged but really tough. The easy version does add the bonus mine which is not on the other hike. Driving from Phoenix, take the Beeline Highway (87) North toward Payson. Take the Sycamore Creek exit (just past mile marker 222), turning left across the divided highway and down the paved road 'Old Highway 87' for 1.2 miles to FR201. Turn right over the cattle guard onto the gravel road (FR201) and proceed 1.2 miles to cross another cattle guard just before a split in the road at FR25. Take the sharp left turn downhill (FR25) and proceed 2.6 miles to a Y in the road. Stay left again and downhill on FR25 (the right leg takes you onto FR25A). Proceed uphill for 2.2 miles (switchbacks) to the Mormon Grove Trailhead. Both FR201 and FR25 are gravel roads - FR25 is slow/rough- loose & hard packed rock, steeper climb up/down than FR201. The Mormon Grove Trailhead is not signed but is obvious since it is where FR25 ends at an old wooden corral.